1. 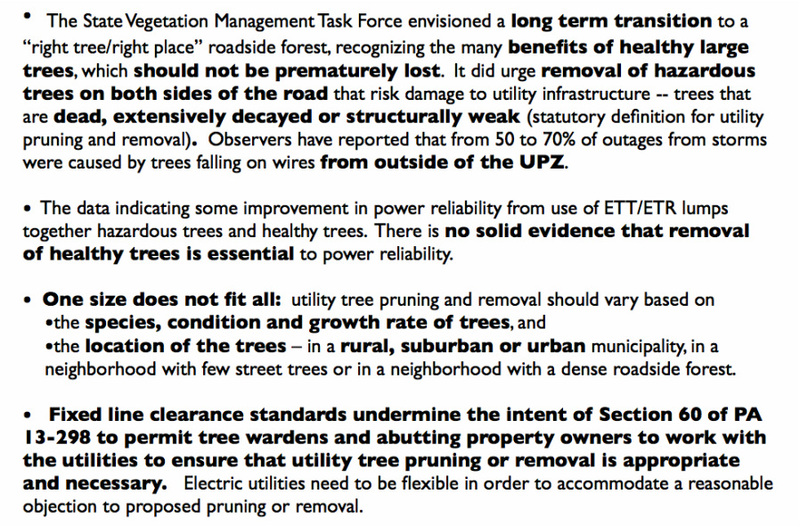 The Garden Club of New Haven supports a balanced approach to securing electric power reliability by removing hazardous trees and branches that pose a risk to the electric utility infrastructure and retaining healthy non-hazardous tall and tall-growing trees. When trees must be removed, the stumps should be ground or removed and the trees should be replaced with “right tree/right place” trees. 2. The Garden Club of New Haven supports data collection prior to and after major storms to determine the extent to which apparently healthy trees cause power outages, what caused each such tree to fail, how long the power outages caused lasted, and how the failure could have been predicted prior to the storm. 3. The Garden Club of New Haven supports undergrounding of distribution wires where feasible as a long term solution, for which planning should begin. ﻿IiNon-hazardous tall and tall growing trees do NOT need to be removed to prevent major power outages.﻿ Based on consultant reports, the Public Utilities Regulatory Authority (PURA) estimated that 78% of the power outages caused by trees during the 2011 major storms were caused by trees outside of the area near or under electric distribution wires (the "normal trim zone"). Anecdotal evidence indicates that 50 to 70% and sometimes 90% of the trees may fall from outside the wire area, depending on the storm and location. To prevent major power outages, the utilities should remove hazardous trees and branches both within and outside the Utility Protection Zone. Tall and tall growing healthy trees should be retained and pruned in accordance with professional pruning standards to co-exist with utility infrastructure. Planting the right tree is more than just ensuring that a tree will not grow into electric utility wires (the lower communications wires are less affected by trees). The article, "Think About Your Urban Trees Before Planting Them . . ." (Next City, December 6, 2013), discusses how trees can be planted to maximize their benefits. It also discusses the impact on carbon emissions of different methods of disposing of trees after they have been cut down.